During orientation, one of the speakers recommended a few restaurants to try around the campus. We decided to stop by the braised chicken restaurant. Braised Chicken, or Jjimdak is a dish made for sharing. It has chicken, carrots, potato, and glass noodles (potato starch noodles). Depending on the restaurant, it can be slightly spicy. A popular restaurant for lunch that was right by our dorm is 딸기, or 'Strawberry' in English. 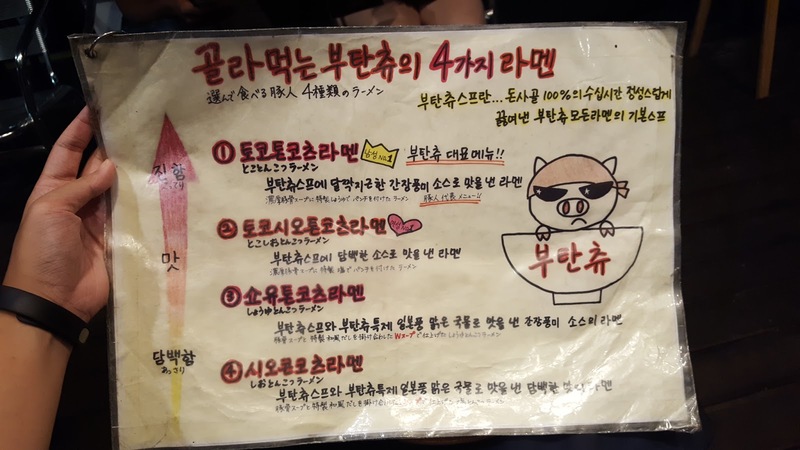 This restaurant is located in the corner, by the CU convenience store when you walk out the east side of the Yonsei campus. 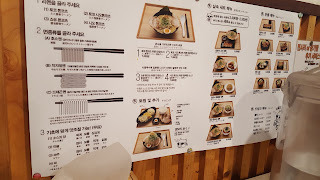 They serve food such as soondubu jjigae (soft tofu stew), or simple hot rice dishes and noodles. 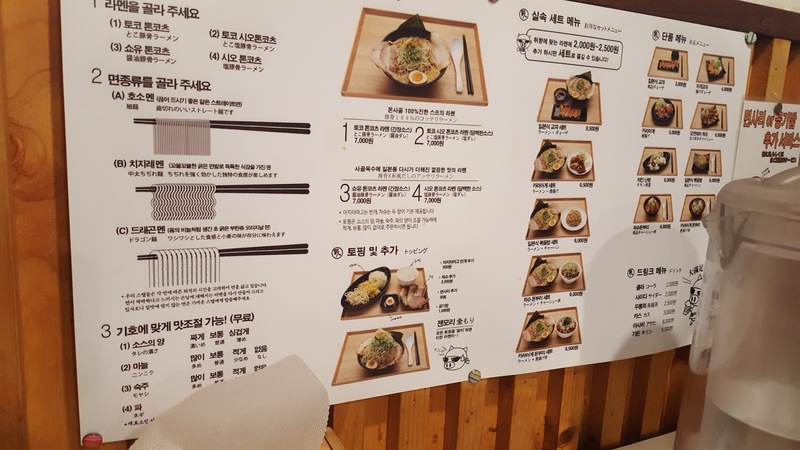 The prices are cheap, which is what makes it a popular choice for Yonsei students. You can easily be full from just 10,000 won. Another restaurant that I found interesting around campus was a Vietnamese restaurant with a modern twist. The exterior of the restaurant looked like a Japanese restaurant, but even more unique was the vending machine that took your order. On the side of the entrance, there was a machine that listed all the menu options--different types of pho, springs rolls, etc. You pay through the machine, and then join the queue on the left side of the entrance. The staff will take note of the number of people in your party--this is best for 2 people because the seating itself is a bar seating, which is not a conversation friendly place. When we were eating, the staff did tell us to quiet down once and we weren't talking that loud. I noticed that many of the people around us came on their own. The interior was an open kitchen style where we could see the chefs prepare the noodles, and toppings in front of us. The meal came with complimentary spring rolls, but they weren't the typical spring rolls I was used to back in the States. These were bright pink, crisp, and filled with a sweet paste (either sweet potato or pumpkin). On the side was a sweet chili dipping sauce. Right next door to this Viet restaurant is a Japanese Ramen restaurant, called Butanchu Ramen, that sells ramen at a very cheap price compared to NYC. 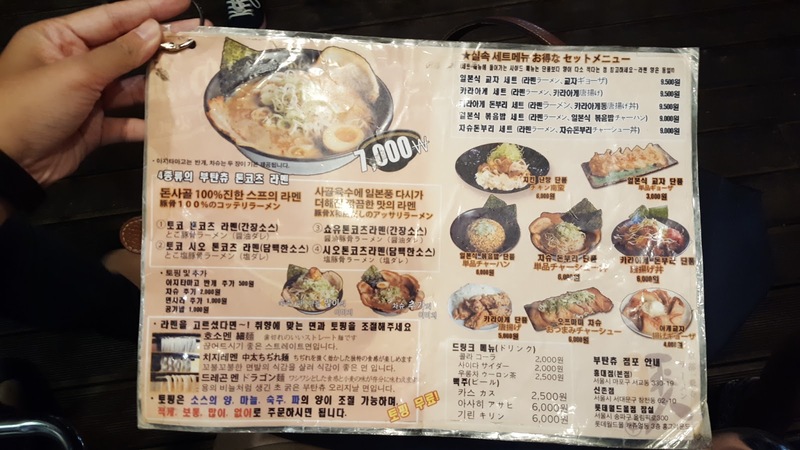 For only 7,000won, which is equal to slightly under $7, you can get a huge bowl of ramen, loaded with thinly cut meat and even half of a soft boiled egg. 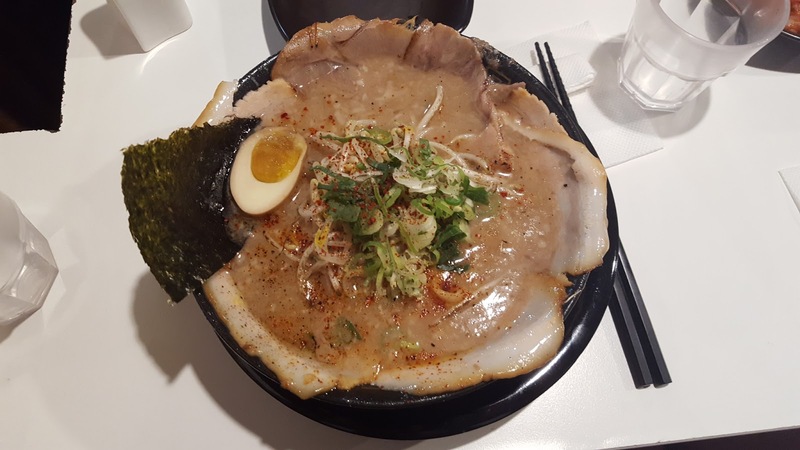 In NYC, a ramen with only 2-3 slices of pork will cost you almost $10 and it may not even come with the soft boiled egg! 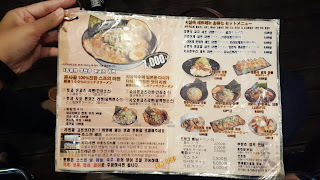 The affordability of food choices in Korea never fail to amaze me--not only is the food cheap, but it also tastes just as good, and the chefs definitely do not skimp out with the ingredients! 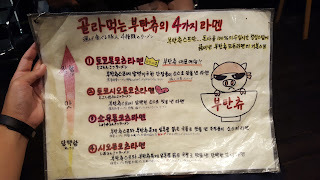 We also had Pork Bone Stew around the Sinchon area--gamjatang. I was really excited to try this because having been a fan of the Youtube channel Eat Your Kimchi (EYK) and avidly watching their Food Adventure Program for Awesome People segment, this dish was one of Martina's favorites. To me, the dish is really different from how my dad prepares pork bone soup. There was definitely a lot more ground pepper and heavy seasoning than I expected. The name itself is misleading--to those who are just learning Korean, one of the common misperceptions is that 감자탕 means potato soup because 감자 is also potato in Korean. However, they will be shocked that there is little to no potato in the stew at all--감자 is actually a traditional (older) word for pork bone. There are also a lot of perilla leaves in this dish. It was an interesting flavor, but I don't think I liked it as much as I thought I would have. But nevertheless, it was still enjoyable.